Mostly stainless steel 304 & 316; also 321, 347, 17-7, 600, X-750 and 52. .005" OD and up, most of our stock is .375" OD or less. Wall thicknesses .002" through .040". Can be cut shorter or manufactured longer on request. Continuous coils are also available upon request. We've made complex parts that are used in high tech medical devices, nuclear applications and have parts being used on the planet Mars right now! See our Fabricated Parts page. 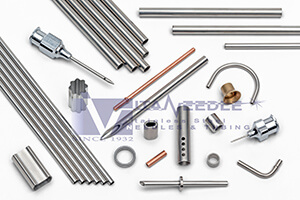 The flagship lines of stainless steel and alloy tubing for hypodermic needles provided by Vita Needle Company are manufactured using the T.I.G. (Tungsten Inert Gas) welded and plug (floating or mandrel) drawn process with full hard temper (typically 150 KPSI minimum). This process has been the "gold standard" for all medical grade tubing for hypodermic needles since the 1960's. The significant amount of cold work put into the material from the drawing process results in the best finishes and hardest tempers (tensile strength) achievable. Burr removal is easiest in the full hard temper condition as chips break off versus "gummy bending" at lower tensile strengths. The welding is done in an inert gas atmosphere which results in superior cleanliness and no surface oxidation. Drawing oils are easily removed with conventional surfactants or can be flushed before final sizing of the tubing for hypodermic needles. Teflon® and CFC's are never used on our products. Over the decades, experience has readily demonstrated that a more forgiving weld zone (no filler metals) produces an optimum fabrication grade material. Vita's TIG welded and plug drawn process yields a consistent, dependable product. Competing processes such as laser welding have several disadvantages when compared to TIG welding. The parameters of the laser weld process require extremely precise strip stock and very tight manufacturing constraints, deviations from which can result in insufficient weld. The demand for "perfect" raw strip alone can be a tall challenge given day-to-day manufacturing realities. At this level, one micro-defect at strip edge could translate into a defective tube. By comparison, TIG welding is a more generous manufacturing process, allowing a slight imperfection in raw material to join equally well in the weldment. Often, manufacturers of laser welded tubing perform the welding very close to final sizing. This may seem like an economical advantage, but without sizing using I.D. tooling, as with Vita's process, some undesirable results can arise: a) total homogenization of the weld zone into the base metal may not be achieved, b) a relatively rough I.D. surface can lead to cleanliness problems, and c) uniform hardness and exacting tolerances are not possible. Concentricity of welded tubing for hypodermic needles is far superior to seamless. However, it is a fallacy to say that an as - welded tube using the laser process (not drawn) provides a measurable improvement in concentricity over TIG welded & drawn material. When applications demand fine finishes, such as laboratory sampling and blood analyzers, Vita can produce premium quality tube using double and even triple plug draws. Where fabrication requirements dictate greater malleability, special runs can be manufactured with tempers ranging from annealed through all intermediate ranges. A technological process limitation exists as average wall sizes approach 2mm. In short, Vita Needle Company maintains one of the broadest inventories of T.I.G. welded, plug drawn, hard temper medical grade tubing for hypodermic needles in the industry. As a result of this high volume, stock and custom runs are offered at very competitive prices typically found when purchasing lower quality, loose tolerance material. It has been well established that our process yields a more rigid, stronger, stiffer product with better finishes and greatly reduced probability of failure in fabrication. The reliability of our process has stood the test of time. Please trust Vita Needle Company's five generations of experience with quality, competitive tube production and fabrication. We have been there and continue to do that!